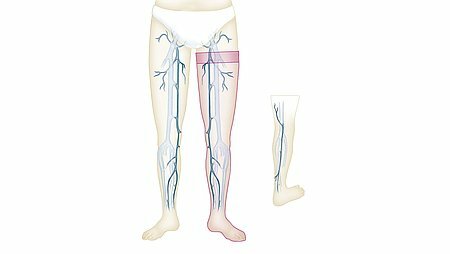 When sclerosing a vein, a special sclerosing substance is injected into the varicose veins, which leads to occlusion and finally sclerosis of the vessels. The treated areas are pressed together with compression bandaging and compression garments (compressed) to promote adhesion of the venous walls. 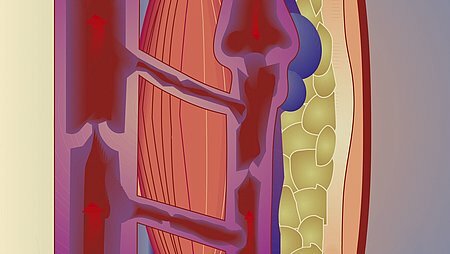 The body reorganises the sclerosed vessels into connective tissue. Thus the medical outcome is comparable to that of an operation to remove varicose veins (vein stripping). If the procedure is medically necessary, the treatment costs are reimbursed by German statutory health insurers. Who is sclerotherapy suitable for? In principle, almost all forms of varicose veins, including those of the saphenous veins, can be treated by sclerotherapy. Sclerosis is the method of choice for the small superficial varicose veins, the so-called spider veins. Superficial or deep vein thrombosis must first be ruled out. The patients must also be mobile, because they are required to take a 30-minute walk after treatment to prevent thrombosis. A needle is first inserted in the vein to be sclerosed. The sclerosing substance is slowly injected into the vein through a cannula. Once the needle has been withdrawn, the treated segment of the vein is immediately compressed. If the varicose veins are very long, the doctor repeats the process at several places along the affected vein. After completion of the procedure, a compression bandage is applied tightly to the leg being treated and a compression stocking is worn for added compression. As a rule, sclerotherapy is performed as an outpatient procedure. However, in order to achieve the optimum outcome, it might be necessary to repeat the sclerotherapy procedure a second or third time in some areas. The patients must wear compression bandaging and compression garments for a few days or even weeks depending on the diameter of the veins treated. During the first few days after sclerosis, they should not take part in any sporting activities and should avoid hot baths, saunas and tanning salons. Venous insufficiency itself cannot be cured by surgery for varicose veins. Therefore, patients should continue to wear their compression garments every day after successful vein surgery, in order to prevent the onset of new varicose veins and enjoy the outcome of the operation for years to come.